In the SPC Office Buddy, you can filter the dimensions you see and ultimately send to Minitab Statistics Reports. You can then use your filter once or save it for later re-use. 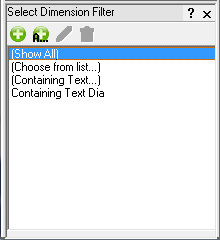 Dimension (column) filtering can be set up in one of two different ways; Choose From List or Containing Text. This method allows you to simply choose the dimensions you want to see from a list of all available dimensions. This is very handy for customers who have lower numbers of dimensions. There is also an advanced listing screen (described below). This method allows you to see dimensions dynamically by entering text on which to search. The only dimensions that are seen are those containing the text you typed. This is very handy for customers who have many dimensions that are named using standard naming conventions. From the Choose From List screen, there is an advanced search which combines the list narrowing power of Containing Text with the simplicity of choosing dimensions from a list. This screen allows you to do individual searches on the entire list and move over the results of each search into the chosen dimension list. This can be very handy if you have a lot of dimensions that are not named in predictable ways.